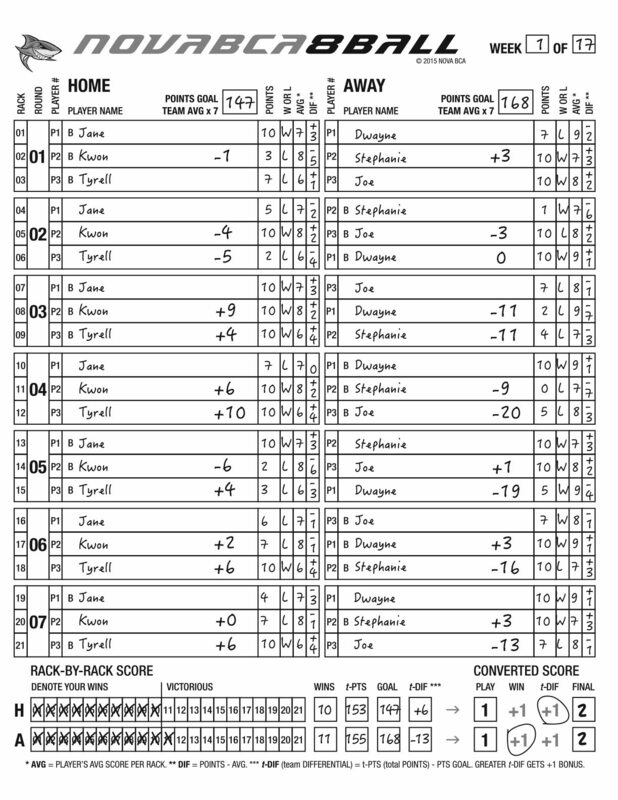 Print a PDF of the scoresheet or Download templates for playing 4 players (as opposed to just 3). In 2015, we remodeled our scoresheet to more closely resemble the one at BCAPL Nationals. There are two north-south rows, one for each team, home and away. The home team starts the lineup card. Neither team is required to show their hand fully at the outset (e.g., complete the full vertical). The exception is if the racks will be shared among four players “evenly” (which is 6-5-5-5). For that template, the home team should complete the grid. Each player in the starting lineup can be subbed to engage six players in the match. The most even way to distribute the racks would be to go 4 and 3 between each starter and his/her sub. After you’ve listed your players, slide to the right from each name and add the player average to the AVG column (see the Plaver Averages tab for these). If a player has no or one week’s worth of scores in a game (note: 8 Ball and 10 Ball AVGs are often different) then leave the AVG box empty. His/her AVG will be identical to the score in each rack. For example, a score of 7 points in the rack will mean a 7 in the AVG column. This number is the sum of all player averages in each vertical. Of course, you won’t always know this number unless you complete your lineup card at the outset. This number represents your team’s typical performance on points. You want to play better than your average. Very simple. It’s 10 points to the winner and one point for each ball pocketed by the loser. Mark the the POINTS box to the right of each player’s name accordingly and add a W or L to make clear the outcome. Head to the bottom of the scoresheet and place an X as each win is recorded. In 10 Ball, be sure to keep track as you go. Don’t assume you’ll win. You can tick the scoresheet, use the beads above the light fixture, use the dial on the table or pulls the balls to one location in the bin beneath the table. Subtract the points in a rack from the player average (AVG) then mark your differential in the DIF column. A differential of 0 indicates you hit your typical score. A negative score means you fell off your AVG. A positive score means you’re ahead of your game. Each round, tally the team’s differential (t-DIF) between the player names and scores. In the first round, there will be one number there. In subsequent rounds, the top number will be the t-DIF for the round and the bottom number will be the running or current tally overall for the match. Learn more about the magic sauce known as differential here and here. There are two bonuses up for grabs. The first one is easy — the team who reaches 11 racks receives one point. The second is less obvious. The team with the more positive team differential (t-DIF) receives the second point. If the teams match each other in this, then they split the point (.5 each). When we say “more positive differential,” we’re trying to indicate which team exceeded their typical performance by more points. A t-DIF of +12 is more positive than +1. Likewise, a t-DIF of -3 is better than -19, and 0 is better than -5. Completing the tallies along the bottom need not be intimidating. Transfer your team points goal from the top of the vertical and populate the GOAL box. Add your final team differential to the t-DIF box. Add the GOAL and t-DIF boxes together then populate the team points or t-PTS box. Slide to the right and circle who won each bonus. Each team gets one point for showing up (so that forfeits can be 0 points). Tally the final score or FINAL boxes. Jane and Tyrell are newer players in the league. Both players average less than a win (7 and 6 points respectively) and can be streaky. Again, if it’s one point per ball pocketed, then a rack score of 7 indicates the player got the 8-Ball but did not get out. Kwon is generally a steady performer. Let’s look at how they fared in the two ways that matter in the final score — rack wins and differential (points scored in a match minus player average). Jane goes 3-4 W/L on racks. Judging from this alone, you might think she’s had a rough night. However, she beats her average performance with 52 points (7 racks x 7 AVG = 49) for a +3 differential. This means her team is at least 3 points ahead of its typical score. Tyrell goes 4-3 W/L on racks. His average performance is 42 points (7 racks x 6 AVG). Like Jane, he also scores 52 points, for a very solid differential of +10. Between this development and Jane’s +3, the home team stands at +13 and is looking good on differential. Kwon goes 3-4 on racks. He starts hot, winning 3 of his first 4. He tails off at the end and loses his final 3 racks. His off night will cost his team the win on racks as they finish with 10 (needing 11 to win the first bonus point). However, his score of 49 is not awful and leaves him with a -7 differential (7 racks x 8 AVG = 56 goal score). Overall, the team misses out on the first bonus point in losing 11-10 on racks. However, their differential is positive overall at +6. They’re behind 2-1, needing their opponents to score +5 or worse on differential to salvage the night with a 2-2 result. The opponents on this night have one of the league’s best three players on their side. Dwayne averages a score of 63 points (7 racks x 9 AVG). Their second player, Stephanie, is a little worse than Jane from the home team. She averages 49 points (7 racks x 7 AVG). Their third player, Joe, is a little better than Kwon from the home team. He shoots for 56 points (7 racks x 8 AVG). Let’s look at how they fared. Dwayne went 4-3 W/L on racks. It’s a subpar night for him. Making matters worse, he scores 54 points — when he normally scores 63 points. One of his losses, he only pocked two balls. Ouch. His differential is a disappointing -9 for the night. He’ll need his teammates to pick him up. Stephanie goes 4-3 W/L on racks. She starts slowly with only 15 points after her 4 racks. The fourth rack stings when she fails to pocket a single ball (zero points). However, she refocuses and closes strong with wins in her final 3 racks. Her final score of 45 leaves her with a differential is -4 (7 racks x 7 AVG = 49 AVG score). While the team needs just 3 wins from Joe to reach 11 and put the first bonus point ion their column, their -13 differential has them trending a 2-2 tie. They’ll probably need Joe to go 4-3 or better on racks and plus score well in the games he loses if they’re to have any chance of a 3-1 win. Joe goes 3-4 W/L on racks. He delivers on points in his loses with 7, 5, 7, 7 respectively. He scores 56 points, hitting his average score for a zero differential (break even). Unfortunately, the team left Joe in a position where he needed to kill it. He played as expected but didn’t have an exceptional match. The team grabs the first bonus point by winning 11-10 on racks. However, their differential is 19 points worse than their opponents (-13 vs. +6). It’s a somewhat surprising result. They felt the grind was enough for an ugly 3-1 win. Instead, it goes down as a 2-2 final and a mild upset.